No mixing. No shaking. No waiting. Fill syringes and start treatment immediately. Sodium nitrite can cause serious adverse reactions and death in humans, even at doses less than twice the recommended therapeutic dose. Sodium nitrite causes hypotension and methemoglobin formation, which diminishes oxygen carrying capacity. Hypotension and methemoglobin formation can occur concurrently or separately. Because of these risks, sodium nitrite should be used to treat acute life-threatening cyanide poisoning and be used with caution in patients where the diagnosis of cyanide poisoning is uncertain. Patients should be closely monitored to ensure adequate perfusion and oxygenation during treatment with sodium nitrite. Alternative therapeutic approaches should be considered in patients known to have diminished oxygen or cardiovascular reserve (e.g. smoke inhalation victims, pre-existing anemia, cardiac or respiratory compromise), and those at higher risk of developing methemoglobinemia (e.g., congenital methemoglobin reductase deficiency) as they are at greater risk for potentially life-threatening adverse events related to the use of sodium nitrite. Cyanide poisoning may result from inhalation, ingestion, or dermal exposure to various cyanide-containing compounds, including smoke from closed-space fires. Sources of cyanide poisoning include hydrogen cyanide and its salts, cyanogenic plants, aliphatic nitriles, and prolonged exposure to sodium nitroprusside. The presence and extent of cyanide poisoning are often initially unknown. There is no widely available, rapid, confirmatory cyanide blood test. Treatment decisions must be made on the basis of clinical history and signs and symptoms of cyanide intoxication. If clinical suspicion of cyanide poisoning is high, NITHIODOTE should be administered without delay. Comprehensive treatment of acute cyanide intoxication requires support of vital functions. Administration of sodium nitrite and sodium thiosulfate should be considered adjunctive to appropriate supportive therapies. Airway, ventilatory and circulatory support, and oxygen administration should not be delayed to administer sodium nitrite and sodium thiosulfate. 2.) Sodium Thiosulfate – 50 mL of a 25% solution (12.5 g) of a sodium thiosulfate solution immediately following administration of sodium nitrite. 2.) Sodium Thiosulfate – 1 mL/kg of body weight using a 25% solution (250 mg/kg or approximately 30-40 mL/m2 of BSA) not to exceed 50 mL (12.5 g) total dose immediately following administration of sodium nitrite. All parenteral drug products should be inspected visually for particulate matter and discoloration prior to administration. Patients should be monitored for at least 24-48 hours after NITHIODOTE administration for adequacy of oxygenation and perfusion and for recurrent signs and symptoms of cyanide toxicity. When possible, hemoglobin/hematocrit should be obtained when treatment is initiated. Measurements of oxygen saturation using standard pulse oximetry and calculated oxygen saturation values based on measured PO2 are unreliable in the presence of methemoglobinemia. Methemoglobin level: Administrations of sodium nitrite solely to achieve an arbitrary level of methemoglobinemia may be unnecessary and potentially hazardous. The therapeutic effects of sodium nitrite do not appear to be mediated by methemoglobin formation alone [see Clinical Pharmacology (12)] and clinical responses to sodium nitrite administration have been reported in association with methemoglobin levels of less than 10%. Administration of sodium nitrite beyond the initial dose should be guided primarily by clinical response to treatment (i.e., a second dose should be considered only if there is inadequate clinical response to the first dose). It is generally recommended that methemoglobin concentrations be closely monitored and kept below 30%. Serum methemoglobin levels should be monitored during treatment using co-oximetry, and administration of sodium nitrite should generally be discontinued when methemoglobin levels exceed 30%. Intravenous methylene blue and exchange transfusion have been reported in the literature as treatments for life-threatening methemoglobinemia. Chemical incompatibility has been reported between NITHIODOTE and hydroxocobalamin and these drugs should not be administered simultaneously through the same IV line. No chemical incompatibility has been reported between sodium thiosulfate and sodium nitrite, when administered sequentially through the same IV line as described in Dosage and Administration. Administration of one vial of each medication constitutes a single dose. See Boxed Warning. Sodium nitrite has been associated with severe hypotension, methemoglobinemia, and death at doses less than twice recommended therapeutic doses. Hypotension may occur concurrently or separately. Sodium nitrite should be used to treat life-threatening cyanide poisoning. When the diagnosis of cyanide poisoning is uncertain and/or the patient is not in extremis, special consideration should be given to administration of sodium nitrite if the patient is known or suspected to have diminished oxygen or cardiovascular reserve (e.g., smoke inhalation victims, pre-existing anemia, substantial blood loss, cardiac or respiratory compromise) or to be at higher risk of developing methemoglobinemia (e.g., congenital methemoglobin reductase deficiency). Supportive care alone may be sufficient treatment without administration of antidotes for many cases of cyanide intoxication, particularly in conscious patients without signs of severe toxicity. Patients should be closely monitored to ensure adequate perfusion and oxygenation during treatment with sodium nitrite. Methemoglobin levels should be monitored and oxygen administered during treatment with sodium nitrite whenever possible. When sodium nitrite is administered to humans a wide range of methemoglobin concentrations occur. Methemoglobin concentrations as high as 58% have been reported after two 300-mg doses of sodium nitrite administered to an adult. Sodium nitrite should be used with caution in the presence of other drugs that may cause methemoglobinemia such as procaine and nitroprusside. Sodium nitrite should be used with caution in patients who may be particularly susceptible to injury from vasodilation and its related hemodynamic sequelae. Hemodynamics should be monitored closely during and after administration of sodium nitrite and sodium thiosulfate, and infusion rates should be slowed if hypotension occurs. Sodium nitrite should be used with caution in patients with known anemia. Patients with anemia will form more methemoglobin (as a percentage of total hemoglobin) than persons with normal red blood cell (RBC) volumes. Optimally, these patients should receive a sodium nitrite dose that is reduced in proportion to their oxygen carrying capacity. Neonates and infants may be more susceptible than adults and older pediatric patients to severe methemoglobinemia when sodium nitrite is administered. Reduced dosing guidelines should be followed in pediatric patients. Sodium nitrite should be used with caution in the presence of concomitant antihypertensive medications, diuretics or volume depletion due to diuretics, or drugs known to increase vascular nitric oxide, such as PDE5 inhibitors. Sodium thiosulfate drug product may contain trace impurities of sodium sulfite. The presence of a trace amount of sulfites in this product should not deter administration of the drug for treatment of emergency situations, even if the patient is sulfite-sensitive. There have been no controlled clinical trials conducted to systematically assess the adverse events profile of sodium nitrite or sodium thiosulfate. The medical literature has reported the following adverse events in association with sodium nitrite or sodium thiosulfate administration. These adverse events were not reported in the context of controlled trials or with consistent monitoring and reporting methodologies for adverse events. Therefore, frequency of occurrence of these adverse events cannot be assessed. In humans, rapid administration of concentrated solutions or solutions not freshly prepared, and administration of large doses of sodium thiosulfate have been associated with a higher incidence of nausea and vomiting. However, administration of 0.1 g sodium thiosulfate per pound up to a maximum of 15 g in a 10-15% solution over 10-15 minutes was associated with nausea and vomiting in 7 of 26 patients without concomitant cyanide intoxication. Formal drug interaction studies have not been conducted with NITHIODOTE. Both sodium nitrite and sodium thiosulfate are Pregnancy Category C. There are no adequate and well-controlled studies in pregnant women. NITHIODOTE should be used during pregnancy only if the potential benefit justifies the potential risk to the fetus. Sodium Nitrite: Sodium nitrite has caused fetal death in humans as well as animals. There are no studies in humans that have directly evaluated the potential reproductive toxicity of sodium nitrite. There are two epidemiological studies conducted in Australia that report a statistically significant increase in the risk for congenital malformations, particularly in the CNS, associated with maternal consumption of water containing nitrate levels in excess of 5 ppm. Results from a case-control study in Canada suggested a trend toward an increase in the risk for CNS malformations when maternal consumption of nitrate were ≥ 26 ppm (not statistically significant). The potential reproductive toxicity of sodium nitrite exposure restricted to the prenatal period has been reported in guinea pigs, mice, and rats. There was no evidence of teratogenicity in guinea pigs, mice, or rats. However, sodium nitrite treatment of pregnant guinea pigs with 60 or 70 mg/kg/day resulted in abortion of the litters within 1-4 days of treatment. All animals treated subcutaneously with 70 mg/kg, sodium nitrite died within 60 minutes of treatment. Further studies demonstrated that a dose of 60 mg/kg resulted in measurable blood levels of methemoglobin in the dams and their fetuses for up to 6 hours post treatment. Maternal methemoglobin levels were higher than the levels in the offspring at all times measured. Based on a body surface area comparison, a 60 mg/kg dose in the guinea pig that resulted in death was only 1.7 times higher than the highest clinical dose of sodium nitrite that would be used to treat cyanide poisoning (based on a body surface area comparison). Studies testing prenatal and postnatal exposure have been reported in mice and rats. Treatment of pregnant rats via drinking water with sodium nitrite at concentrations of either 2000 or 3000 mg/L resulted in a dose-related increased mortality postpartum. This exposure regimen in the rat model would result in dosing of approximately 220 and 300 mg/kg/day (43 and 65 times the highest clinical dose of sodium nitrite that would be used to treat cyanide poisoning, based on a body surface area comparison). Sodium nitrite produces methemoglobin. Fetal hemoglobin is oxidized to methemoglobin more easily than adult hemoglobin. In addition, the fetus has lower levels of methemoglobin reductase than adults. Collectively, these data suggest that the human fetus would show greater sensitivity to methemoglobin resulting in nitrite-induced prenatal hypoxia leading to retarded development of certain neurotransmitter systems in the brain and long lasting dysfunction. Sodium Thiosulfate: There are no reported epidemiological studies of congenital anomalies in infants born to women treated with sodium thiosulfate during pregnancy. In animal studies, there are no teratogenic effects in offspring of hamsters treated during pregnancy with sodium thiosulfate in doses similar to those given intravenously to treat cyanide poisoning in humans. Other studies suggest that treatment with sodium thiosulfate ameliorates the teratogenic effects of maternal cyanide poisoning in hamsters. In other studies, sodium thiosulfate was not embryotoxic or teratogenic in mice, rats, hamsters, or rabbits at maternal doses of up to 550, 400, 400 and 580 mg/kg/day, respectively. Nonteratogenic Effects: Behavioral and neurodevelopmental studies in rats suggest persistent effects of prenatal exposure to sodium nitrite that were detectable postnatally. Specifically, animals that were exposed prenatally to sodium nitrite demonstrated impaired discrimination learning behavior (both auditory and visual) and reduced long-term retention of the passive-avoidance response compared to control animals. Additional studies demonstrated a delay in the development of AchE and 5-HT positive fiber ingrowth into the hippocampal dentate gyrus and parietal neocortex during the first week of life of prenatal nitrite treated pups. These changes have been attributed to prenatal hypoxia following nitrite exposure. Because fetal hemoglobin is more readily oxidized to methemoglobin and lower levels of methemoglobin appear to be fatal to the fetus compared to the adult, sodium nitrite should be used during labor and delivery only if the potential benefit justifies the potential risk to the fetus. It is not known whether sodium nitrite or sodium thiosulfate is excreted in human milk. Because NITHIODOTE may be administered in life-threatening situations, breast-feeding is not a contraindication to its use. Because many drugs are excreted in human milk, caution should be exercised following NITHIODOTE administration to a nursing woman. There are no data to determine when breastfeeding may be safely restarted following administration of sodium nitrite and sodium thiosulfate. In studies conducted with Long-Evans rats, sodium nitrite administered in drinking water during pregnancy and lactation resulted in severe anemia, reduced growth and increased mortality in the offspring. There are case reports in the medical literature of sodium nitrite in conjunction with sodium thiosulfate being administered to pediatric patients with cyanide poisoning; however, there have been no clinical studies to evaluate the safety or efficacy of sodium thiosulfate or sodium nitrite in the pediatric population. As for adult patients, dosing recommendations for pediatric patients have been based on theoretical calculations of antidote detoxifying potential, extrapolation from animal experiments, and a small number of human case reports. Sodium nitrite must be used with caution in patients less than 6 months of age because they may be at higher risk of developing severe methemoglobinemia compared to older children and adults. The presence of fetal hemoglobin, which is oxidized to methemoglobin more easily than adult hemoglobin, and lower methemoglobin reductase levels compared to older children and adults may contribute to risk. Sodium nitrite and sodium thiosulfate are known to be substantially excreted by the kidney, and the risk of adverse reactions to these drugs may be greater in patients with impaired renal function. Because elderly patients are more likely to have decreased renal function, care should be taken in dose selection, and it may be useful to monitor renal function. Sodium nitrite and sodium thiosulfate are known to be substantially excreted by the kidney, and the risk of toxic reactions to these drugs may be greater in patients with impaired renal function. Because elderly patients are more likely to have decreased renal function, care should be taken in dose selection, and it may be useful to monitor renal function. NITHIODOTE is a cyanide antidote which contains one 10 mL glass vial of a 3% solution of sodium nitrite injection and one 50 mL glass vial containing a 25% solution of sodium thiosulfate injection. 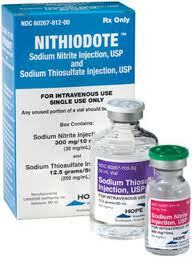 Sodium nitrite injection is a sterile aqueous solution and is intended for intravenous injection. Each vial contains 300 mg of sodium nitrite in 10 mL solution (30 mg/mL). Sodium nitrite injection is a clear solution with a pH between 7.0 and 9.0. Sodium thiosulfate injection is a sterile aqueous solution and is intended for intravenous injection. Each vial contains 12.5 grams of sodium thiosulfate in 50 mL solution (250 mg/mL). Each mL also contains 2.8 mg boric acid and 4.4 mg of potassium chloride. The pH of the solution is adjusted with boric acid and/or sodium hydroxide. Sodium thiosulfate injection is a clear solution with a pH between 7.5 and 9.5. Na2S2O3 + CN– → SCN- + Na2SO3. When 4 mg/kg sodium nitrite was administered intravenously to six healthy human volunteers, the mean peak methemoglobin concentration was 7%, achieved at 30-60 minutes after injection, consistent with reports in cyanide poisoning victims. Supine systolic and diastolic blood pressures dropped approximately 20% within 10 minutes, a drop which was sustained throughout the 40 minutes of testing. This was associated with a 20 beat per minute increase in pulse rate that returned to baseline in 10 minutes. Five of these subjects were unable to withstand orthostatic testing due to fainting. One additional subject, who received a 12 mg/kg dose of sodium nitrite, experienced severe cardiovascular effects and achieved a peak methemoglobin concentration of 30% at 60 minutes following injection. Oral doses of 120 to 180 mg of sodium nitrite administered to healthy volunteers caused minimal cardiovascular changes when subjects were maintained in the horizontal position. However, minutes after being placed in the upright position subjects exhibited tachycardia and hypotension with syncope. The half life for conversion of methemoglobin to normal hemoglobin in a cyanide poisoning victim who has been administered sodium nitrite and sodium thiosulfate is estimated to be 55 minutes. In dogs, pretreatment with sodium thiosulfate to achieve a steady state level of 2 µmol/mL increased the rate of conversion of cyanide to thiocyanate over 30-fold. Thiosulfate taken orally is not systemically absorbed. Most of the thiosulfate is oxidized to sulfate or is incorporated into endogenous sulphur compounds; a small proportion is excreted through the kidneys. Approximately 20-50% of exogenously administered thiosulfate is eliminated unchanged via the kidneys. After an intravenous injection of 1 g sodium thiosulfate in patients, the reported serum thiosulfate half-life was approximately 20 minutes. However, after an intravenous injection of a substantially higher dose of sodium thiosulfate (150 mg/kg, that is, 9 g for 60 kg body weight) in normal healthy men, the reported elimination half-life was 182 minutes. The apparent terminal elimination half life and volume of distribution of cyanide, in a patient treated for an acute cyanide poisoning with sodium nitrite and sodium thiosulfate administration, have been reported to be 19 hours and 0.41 L/kg, respectively. Additionally, an initial elimination half life of cyanide has been reported to be approximately 1-3 hours. The potential benefit of an acute exposure to sodium nitrite as part of a cyanide antidote outweighs concerns raised by the equivocal findings in chronic rodent studies. Sodium nitrite (0, 750, 1500, or 3000 ppm equivalent to average daily doses of approximately 0, 35, 70, or 130 mg/kg for males and 0, 40, 80, or 150 mg/kg for females) was orally administered to rats (Fischer 344 strain) for 2 years via drinking water. There were no significant increases in the incidence of tumor in either male or female rats. Sodium nitrite (0, 750, 1500, or 3000 ppm equivalent to average daily doses of approximately 0, 60, 120, or 220 mg/kg for males and 0, 45, 90, or 165 mg/kg for females) was administered to B6C3F1 mice for 2 years via the drinking water. Equivocal results were obtained in female mice. Specifically, there was a positive trend toward an increase in the incidence of squamous cell papilloma or carcinoma in the forestomach of female mice. Although the incidence of hyperplasia of the glandular stomach epithelium was significantly greater in the high-dose male mice compared to controls, there were no significant increases in tumors in the male mice. Numerous reports in the published literature indicate that sodium nitrite may react in vivo with secondary amines to form carcinogenic nitrosamines in the stomach. Concurrent exposure to sodium nitrite and secondary amines in feed or drinking water resulted in an increase in the incidence of tumors in rodents. Long-term studies in animals have not been performed to evaluate the potential carcinogenicity of sodium thiosulfate. Sodium nitrite is mutagenic in S. typhimurium strains TA100, TA1530, TA1535 with and without metabolic activation; however, it was negative in strain TA98, TA102, DJ460 and E. coli strain WP2UVRA/PKM101. Sodium nitrite has been reported to be genotoxic to V79 hamster cells in vitro and in the mouse lymphoma assay, both assays conducted in the absence of metabolic activation. Sodium nitrite was negative in the in vitro chromosomal aberrations assay using human peripheral blood lymphocytes. Acute administration of sodium nitrite to male rats or male mice did not produce an increased incidence of micronuclei in bone marrow. Likewise, sodium nitrite administration to mice for 14-weeks did not result in an increase in the incidence of micronuclei in the peripheral blood. The mutagenic potential of sodium thiosulfate has been examined in the in vitro Bacterial Reverse Mutation Assay (Ames Assay). Sodium thiosulfate was not mutagenic in the absence of metabolic activation in S. typhimurium strains TA98, TA100, TA1535, TA537, or TA1538. Sodium thiosulfate was not mutagenic in the presence of metabolic activation in strains TA 98, TA1535, TA1537, TA1538 or E. coli strain WP2. Clinical studies to evaluate the potential effects of either sodium nitrite or sodium thiosulfate intake on fertility of either males or females have not been reported. In contrast, multigenerational fertility and reproduction studies conducted by the National Toxicology Program did not detect any evidence of an effect of sodium nitrite (0.0, 0.06, 0.12, and 0.24% weight/volume) on either fertility or any reproductive parameter in Swiss CD-1 mice. This treatment protocol resulted in approximate doses of 125, 260, and 425 mg/kg/day. The highest exposure in this mouse study is 4.6 times greater than the highest clinical dose of sodium nitrite that would be used to treat cyanide poisoning (based on a body surface area comparison). There are no preclinical studies examining the effects of sodium thiosulfate on fertility. Due to the extreme toxicity of cyanide, experimental evaluation of treatment efficacy has predominantly been completed in animal models. The efficacy of sodium thiosulfate treatment alone to counteract the toxicity of cyanide was initially reported in 1895 by Lang. The efficacy of amyl nitrite treatment in cyanide poisoning of the dog model was first reported in 1888 by Pedigo. Further studies in the dog model, which demonstrated the utility of sodium nitrite as a therapeutic intervention, were reported in 1929 by Mladoveanu and Gheorghiu. However, Hugs and Chen et al. independently reported upon the superior efficacy of the combination of sodium nitrite and sodium thiosulfate in 1932-1933. Treatment consisted of intravenously administered 22.5 mg/kg (half the lethal dose) sodium nitrite or 1 g/kg sodium thiosulfate alone or in sequence immediately after subcutaneous injection of sodium cyanide into dogs over a range of doses. Subsequent doses of 10 mg/kg sodium nitrite and/or 0.5 g/kg sodium thiosulfate were administered when clinical signs or symptoms of poisoning persisted or reappeared. Either therapy administered alone increased the dose of sodium cyanide required to cause death, and when administered together, sodium nitrite and sodium thiosulfate resulted in a synergistic effect in raising the lethal dose of sodium cyanide. The combined therapy appeared to have reduced efficacy when therapy was delayed until signs of poisoning (e.g. convulsions) appeared; however, other investigators have reported survival in dogs that were administered antidotal treatment after respiratory arrest had occurred. Animal studies conducted in other species (e.g., rat, guinea pig, sheep, pigeon and cat) have also supported a synergistic effect of intravenous sodium nitrite and sodium thiosulfate in the treatment of cyanide poisoning. While intravenous injection of sodium nitrite and sodium thiosulfate was effective in reversing the effects of lethal doses of cyanide in dogs, intramuscular injection of sodium nitrite, with or without sodium thiosulfate, was found not to be effective in the same setting. The human data supporting the use of sodium nitrite for cyanide poisoning consists primarily of published case reports. There are no randomized controlled clinical trials. Nearly all the human data describing the use of sodium thiosulfate report its use in conjunction with sodium nitrite. Dosing recommendations for humans have been based on theoretical calculations of antidote detoxifying potential, extrapolation from animal experiments, and a small number of human case reports. There have been no human studies to prospectively and systematically evaluate the safety of sodium thiosulfate or sodium nitrite in humans. Available human safety information is based largely on anecdotal case reports and case series of limited scope. Store at controlled room temperature between 20°C and 25°C (68°F – 77°F); excursions permitted to 15-30°C (59 to 86°F). Protect from direct light. Do not freeze. NITHIODOTE is indicated for cyanide poisoning and in this setting, patients will likely be unresponsive or may have difficulty in comprehending counseling information.